Nights out in a big city might can make for a welcome change of pace from time to time. Such nights can stretch budgets, making it more financially savvy for non-city dwellers to stay close to home. Small towns and medium-sized boast plenty of budget-friendly activities for people looking nights out on the town. · Paint and sip: Paint and sip events are fun, affordable ways to gather with friends. People who sign up for such events, which may be held in bars, restaurants, studios, or elsewhere, are guided step-by-step as they recreate a featured painting. Some paint and sip events allow guests to bring their own alcohol, while events held at bars or restaurants may provide alcohol for an extra cost. · Cooking class: Whether heading out with your significant other or a night with friends, a cooking class can be more unique, educational and affordable than a night out at a restaurant. Some classes may offer discounts to large groups, so enlist some friends if the goal of the night is fun and not necessarily romance. 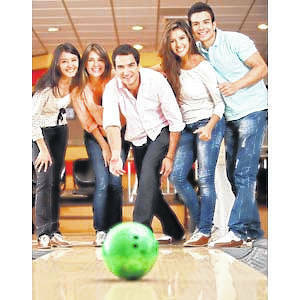 · Bowling: Bowling is a fun, affordable activity that people of all skill levels can enjoy. If you have enough friends interested in making a night of bowling, reserve a lane or lanes in advance so you won’t have to wait. And if everyone has a good time, look into creating a team and joining a league. Many bowling alleys host league nights that can also serve as great opportunities to meet people. · Live music: Arenas and football stadiums are not the only places that showcase talented musicians. Music lovers with a passion for live music can visit local venues that cater to local musicians or even more established professionals who play small venues. Open mic nights at local bars can introduce music fans to new artists and/or styles of music, and can provide great opportunities to meet fellow music lovers in your area. While big city residents may never lack for entertainment, small towners and residents of medium-sized cities can no doubt find plenty of fun and affordable things to do in their communities.